There are currently 84,702 users on this website. Hi! I'm new here but I need a bit of help with a coin that I own. 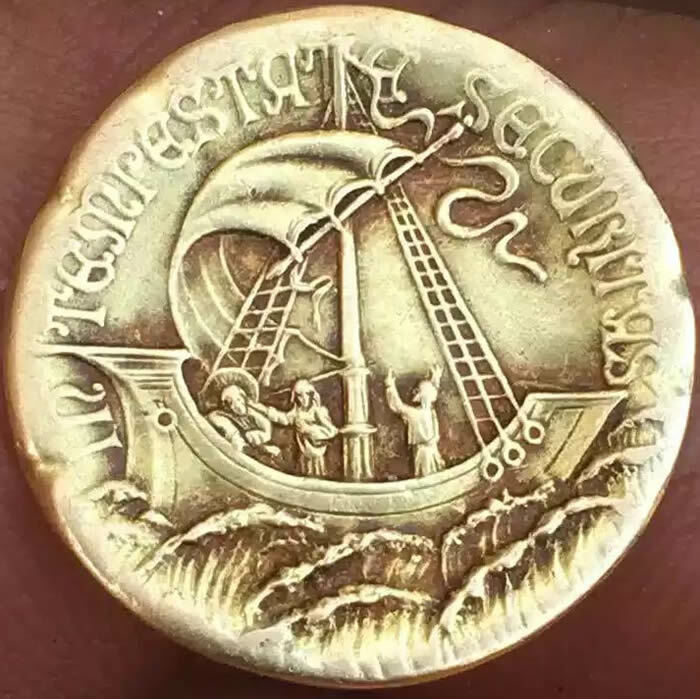 I have this coin, it seems really old. Everything on it is engraved and it is of gold material. I have no clue when it was made or anything like that. Would any of you know its value? I'm a bit stumped. Thanks! to CCF. I do not think it is a coin. Seems like a medal of some sort. Give it a bit and more members will chime in. It's a religious medal to be sure. Reverse refers to the bible story in Matthew 8:23-27, Mark 4:35-41, and Luke 8:22-25 in which Jesus and his disciples were crossing the Sea of Galilee when a storm struck the boat. Jesus was taking a nap, and had to be woken by his disciples - he reprimanded them for their lack of faith, and calmed the storm instantly. I can find a lot of similar medals online, but not a match. 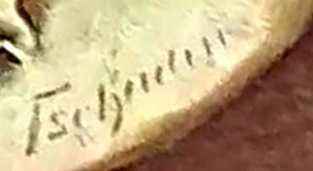 Based on the engraver's signature, I would guess late 19th or early 20th century? This is commonly known as the Seaman's medal, although yours varies from the norm quite a lot. The story of Christ calming the waters. Count vonMansfeld and honoured his family's patron saint. The von Mansfeld family trade was warfare and his symbol was adopted for luck by his mercenary troops. 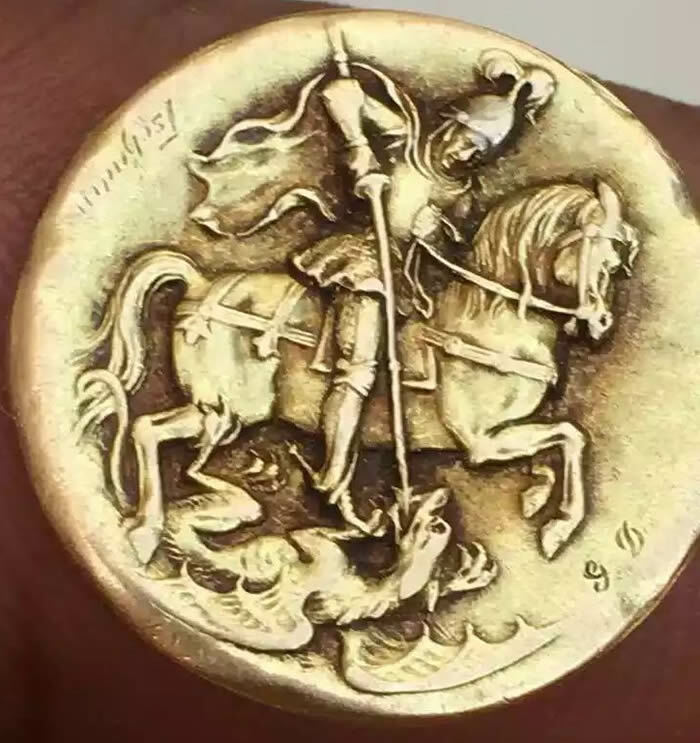 Skipping forward a century or so and the thaler had been replaced by a charm or amulet bearing St George but now with the addition of Christ on the reverse. This design is generally credited to a Hungarian engraver, Christian Hermann Roth and, with modifications, has been in continuous production ever since. Yours is the first that I've seen without the St Georgius and most certainly the first signed piece. Sadly I can't make out the signature. The weight and diameter would also be interesting. Could be the French sculptor Raymond Tschudin. Not his usual signature, but the letters seem to match pretty well. Thank you for all of your replies! It weighs 4.5 grams and has a diameter of 4.